Indian cricket team has had the luxury of having some great and tenacious openers who have contributed to its much celebrated and eventful history. The openers have ranged from the calibre of the stubborn resistance of Sunil Gavaskar to the bold strokes of Virender Sehwag to the monk-like concentration of Murali Vijay. This display of immaculate technique and scrupulous concentration at the top, helped India immensely in shaping its batting renaissance at the turn of the century. It was the time when the openers laid the right foundation at the start of the innings which paved the way for the other batsman to consolidate India's position to that of the dominating team in the match. This change led to many triumphs overseas and home alike, where India used the right amount of guile and also a touch of refreshing candour to outmanoeuvre the opposition. These victories would not have been possible without the openers who themselves were not the ideal candidates but rather a gamble that worked wonders for both the team and the individuals. So here are three such great openers who once batted in the middle order but transformed themselves into colossal batsman once they got promoted up the order. 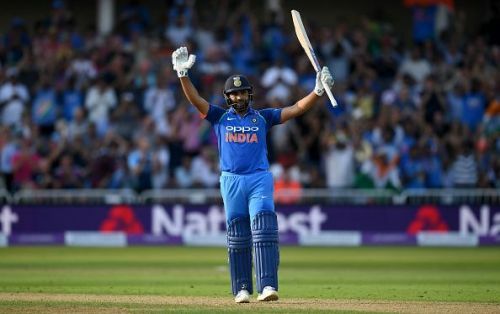 There is no better sight in world cricket today, especially in limited overs cricket, than to watch Rohit Sharma playing the pull shot on the front foot with his usual nonchalance and a hint of disdain in his follow through when he sees the ball before dispatching it to the stands. While this has now become a frequent sighting to behold, it wasn't as regular before he started to open for the Indian team. This becomes the most evident when we look at his numbers before and after opening. He scored 2 centuries and 12 fifties batting in positions from #3 to #7 at an average of 26.8 and a strike rate of 76.49. These less than ordinary numbers changed to extraordinary once he started to open for his country in the victorious Champions Trophy campaign, where he scored 177 runs in 5 matches at an average of 35. While the numbers were still ordinary, but 2013 was the first time he completed 1000 runs in a calendar year and he has not looked back ever since. The drastic change in his batting approach and ability to stay at the crease for longer periods of time, moulded him into a batting behemoth with his current numbers matching up to his ability.